This fabulous sandals that I found on sale at Zara...I love it.... comfortable, trendy and the perfect color to change any outfit in a spectacular way! I hope you like it my Interview HERE for this cool Website OfertaRopa that I did last week...you will have the opportunity to know a little bit more about ME! The truth is I'm not very into of the big fashion webpages, always I'm visiting blogs that they give me information about how is the tendency, but I have to say that I frequently visit this two ModaMarcas and OfertaRopa. I can know what it's going on in the fashion world, collections, catwalks or just to know the the boutique online of Adolfo Dominguez.....the fashion world always offer to us daily fashion news! Lo cierto es que no soy muy aficionada a las grandes páginas de moda, más bien suelo visitar blogs que me ponen al día de las tendencias, pero he de decir que tengo dos webs que frecuentemente me gusta visitar, una es ModaMarcas y la otra es OfertaRopa, así puede saber que sucede en el mundo de la moda, nuevas fechas para colecciones, pasarelas o por ejemplo saber de la tienda online de Adolfo Dominguez .......el mundo de la moda nos ofreces novedades cada día! Love this magazine...and the issue from Vogue Japan is just exquisite....love it ...thank my friend for bringing to me this great magazine from abroad.... as the cover says "it's a simple pleasure". 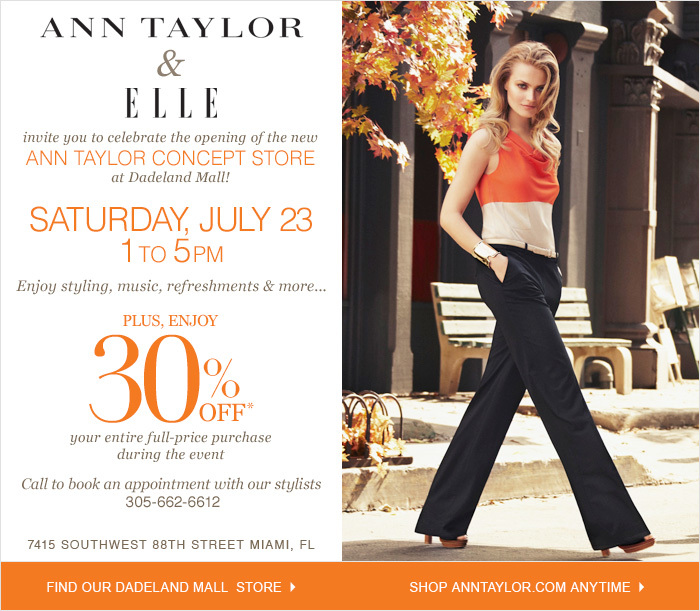 If you live or are you in Miami go to this weekend to the Grand Opening of Ann Taylor Concept Store & ELLE this Saturday, July 23 between 1 to 5pm at Dadeland Mall. It's going to be a time to celebrate the fashion, the concept and the new chic and stylish Ann Taylor. I'm going to be around, so come to say hello...I would love to talk about fashion!!!! Have a great weekend, enjoy my new Blog and see you on Monday! Love all yours love now! gorgeous shade of green. Perfecto para el verano!